Comes Home on Blu-ray™ and DVD November 3! LOS ANGELES, CA (July 8, 2015) –Metro-Goldwyn-Mayer (MGM) and Twentieth Century Fox Home Entertainment bring A.D.: The Bible Continues, the uplifting spiritual journey through the later chapters of biblical history from executive producers Roma Downey (The Bible) and Mark Burnett (The Voice, The Bible), to Blu-ray™ and DVD November 3. Continuing the Bible – Roma Downey and Mark Burnett discuss their decision to create a sequel to the “The Bible” – how the project came to be, why it is different from “The Bible,” and how the story begins and evolves. Casting A.D. – An epic miniseries means an epic sized cast. Visit the actors on and off set as they discuss their characters and share their stories of coming to the project. The Past Comes Alive – Get a behind-the-scenes look at the filming of several key scenes, including the baptism of Saul, the elaborate arrival of high Roman officials, and banquet feasts in Pilate’s palace courtyard. The Fabric of the Time – Explore the massive feat of dressing cast and extras in period costume. Tour the costume tent and visit with many of the actors as they show us the elaborate detail that went into creating their garments, including a time lapse of Pablo Di Pace as Jesus being made up for the crucifixion. Recreating the Power of God – Join visual effects supervisor Martin Davison as he discusses bringing the power of God to life in A.D. through practical and visual effects. From executive producers Roma Downey (“The Bible”) and Mark Burnett (“The Bible,” “The Voice”) comes an uplifting spiritual journey through the later chapters of biblical history. “A.D. The Bible Continues” picks up where the smash hit miniseries “The Bible” left off, continuing the greatest story ever told and exploring the exciting and inspiring events that followed the Crucifixion of Christ. 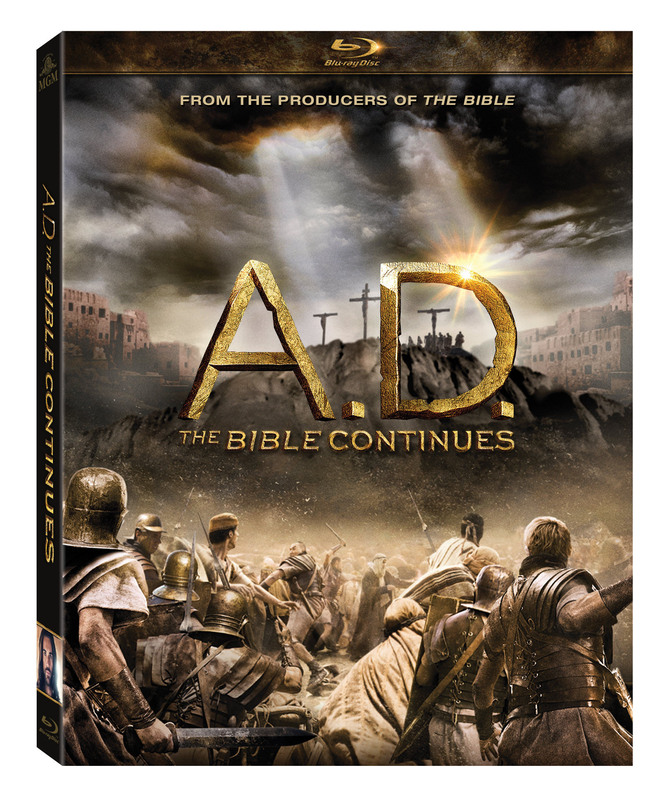 Set in a world of bloody Roman oppression, and bitter political rivalries, the struggle to control The Holy Land unfolds between the Apostles, Pontius Pilate, Caiaphas, the Zealots, and the Herod Family struggle to control The Holy Land. The series aired on NBC and was produced by LightWorkers Media with Burnett, Downey and Richard Bedser serving as executive producers. United Artists Media Group (UAMG) is a joint venture among MGM, Mark Burnett, Roma Downey and Hearst Corporation, focused on developing, producing and financing premium content across all platforms, including scripted and non-scripted television programs, motion pictures and digital content. Celebrated Emmy®-nominated actress and producer Roma Downey and her award-winning husband, producer Mark Burnett, launched LightWorkers Media in 2011 with the children’s DVD and book series LITTLE ANGELS and its companion LITTLE ANGELS STORYBOOK BIBLE. LightWorkers Media produced the 10-hour hit miniseries THE BIBLE, which was seen in the USA by 100 million people, was one of the fastest selling TV-to-disc titles ever and was nominated for three Emmy® awards. In addition, Roma and Mark have co-authored several books published by Faithwords. They are ambassadors for two children’s organizations, Operation Smile and Compassion. LightWorkers Media is dedicated to shining a light and bringing uplifting content to people of all ages. Metro-Goldwyn-Mayer is a leading entertainment company focused on the production and distribution of film and television content globally. The company owns one of the world’s deepest libraries of premium film and television content. In addition, MGM has investments in domestic and international television channels and is the majority owner of and distributor for United Artists Media Group (UAMG). For more information, visit www.mgm.com.